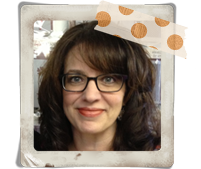 I'm posting over on the Sweet 'n Sassy AND the eclectic Paperie blogs today! Head on over and check out all of the details!! Welcome to day 5 of our August feature Blog Hops! 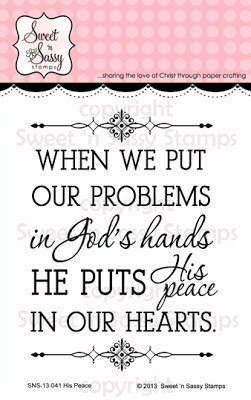 Today we're featuring two great sets in a new series of large inspirational sentiments, His Peace and Calms His Child. And I have to say...I LOVE these! Having this giant sentiment being front and center on a card is sometimes the best way to go and both of these sets offer two beautiful and encouraging texts. 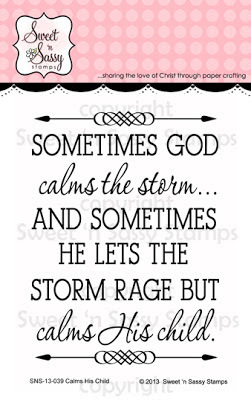 I used the Calms His Child sentiment for my card because too often we want to storm to be quieted and fail to recognize how much God can work in the midst of a storm. There is great comfort in knowing that He will and does bring overwhelming peace to those that call upon His great and mighty name! 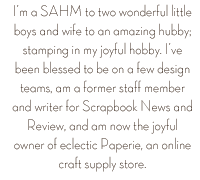 As you can see, I got a little crazy with kraft cardstock again...love that stuff...and simply added a bit of light stenciling to the background of text area. I also pulled out some more of those leave pins, some lace, blingy button, and texture from an embossing folder. Want to see more? Scroll down to see both sets and links to the rest of the design teams work! Hope you enjoyed this week's release!! Tons of great stuff to choose from! 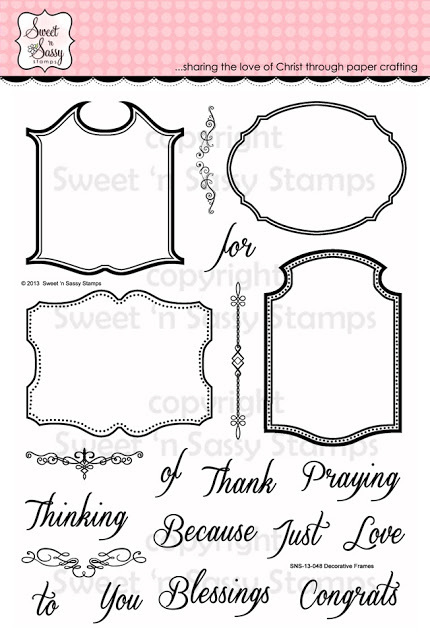 Set measures approximately 3" x 4"
Stamp measures approximately 2 1/2" x 3 3/8"
Be sure to leave a comment of each of the blogs along your journey because we're giving both of these sets away to one lucky winner! The deadline to comment for a chance to win is midnight EST Friday, August 16th. The list of winners will be announced on our website homepage by Monday, August 19th. Welcome to day 4 of our August feature Blog Hops! 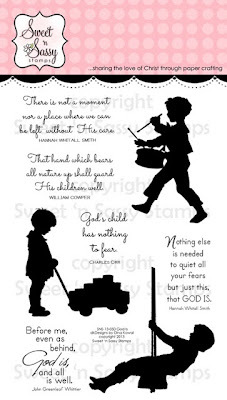 Today we're featuring Dina's wonderful companion set to His Child called God Is. And we all know how I feel about silhouette stamp sets...LOVE them so this is definitely one of my favs from this month's release! I kept the stamping of this card fairly simple and highlighted with this beautiful paper from My Minds Eye. I stamped the drummer boy (isn't this the sweetest image?!) on a piece of text paper, after adding some of those yummy polka dots from a stencil. Want to see more? Check out the entire set below along with links to the rest of the design teams work! The drummer boy image measures approximately 1 1/2" x 2 1/2"
Be sure to leave a comment of each of the blogs along your journey because we're giving this set away to one lucky winner! Welcome to day 3 of our August feature Blog Hops! 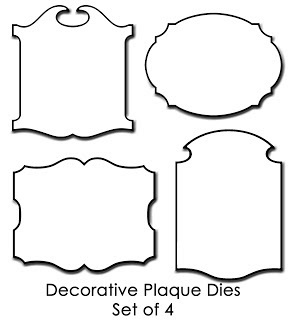 Today we're featuring a wonderful new set, Decorative Frames, that coordinates with one of our existing die sets, Decorative Plaques....a perfect match! This is one of those stamp set and die combinations that should be added to everyone's stash! 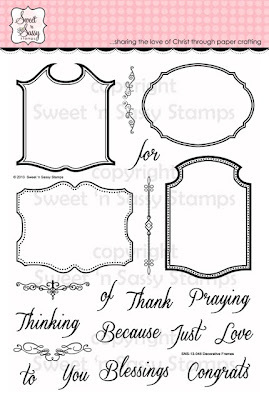 Seriously, so many uses for these beautifully shaped dies and I love that the stamps create an amazing border...the details are wonderful! I layered my card with some pretty papers from My Minds Eye (the Honey collection), lots of kraft cardstock, flowers from Petaloo, decorative pins from Maya Road, and some swirly bling! We've got a little bit of everything going on with today's card...and I love all of those goodies! Check out the full stamp and die sets below along with links to the rest of the design team's creations! The top left image measures approximately 2 3/8" x 2 5/8"
Be sure to leave a comment of each of the blogs along your journey because we're giving this stamp set away to one lucky winner!